In most of the companies, before the employer or the boss hires a person to work for them, they assume that the individual they are about to hire already knows how to carry on certain tasks in the workplace from time to time whenever required. At times the tasks which need to be carried out may be complex or simple depending when it comes up in the workplace and it is essential for a person who is about to be employed to know which of the tasks they need to know. So for the person to not have any problem in the future, it is essential that they know the tasks which have been mentioned below. One of the daily tasks which are carried out in the workplace is sending out professional emails to people concerned with the organization. People who are under the age of 30 will have much better knowledge of writing emails in comparison to people above the age of 30 and they should learn it as soon as they can. Writing formal business related emails is very different than writing informal emails and they should understand it before sending out the email. Everyday in the workplace daily tasks need to be carried out which needs a proper use of speech. For example while writing information or any other kind of business related topics, the person should know to use the right grammar and know the right spelling while writing or typing it. Should avoid use of any kinds of slangs or unwanted abbreviations as this information refers to a formal use and it is professional. Everything in this advancing world of technology runs on computers which basically in the business world needs good typing skills. So before going for a job interview, the person should have done a course or know how to type well as the boss would assume that the person approaching for the job would know how to type well and so the person does not get embarrassed when work comes across them. They should have a knowledge of typing in advance. Everywhere at the moment the basic language which people refer to is english. And the person needs to have a good knowledge of the basic language carried out in the workplace as it is really necessary to carry out daily tasks in the workplace in a much smoother way and communication will be better on an everyday basis. This can happen in the workplace though people are opting to send out emails instead, but a time may arise when a written memo or a business letter needs to be sent out. So for this, the person needs to know in advance the right and appropriate format needs to write a business letter and do it in a proper manner so that the boss may not have a bad impression on the person. It is a basic concept which happens in the life of every individual of answering phone calls but at times these phone calls are personal phone calls. In case of a business call, the concept refers to a more professional way towards answering the phone and this should be done in a way where the person talking to the client should first mention their name by identifying themselves and then the name of the company or the department they are working in, making it professional. When the individual meets someone new, they should always be polite enough to introduce themselves first and when the person is working they should also have the ability to introduce one person to the other. Introductions in the professional world of business should always be done on a first name or a last name basis so that the level of professionalism isn’t left out. In the workplace, it is common that at some point some mistake may be caused by the employee or some one else also. So the boss assumes that at the time of the interview, the person can handle this type of a situation and at once identify that they have made a mistake and apologize for it or even take the blame for someone else. So the individual should be well prepared for this whenever it happens. Most of the jobs in the business world involve in attending meetings and often it is expected that a certain amount of written records which are also known as minutes needs to be kept at the meeting which the person needs to know when carrying out the job. It will help the people in keeping a track of all the people who have attended the meetings along with taking notes at the time of discussions. And also the person should know that they need to type the minutes after the meeting has finished. One of the tasks which come across the employee in their work is making phone calls to different clients or people who represent or are associated with the business and the boss or the employer assumes that the person knows this ability well enough. So the person when making a phone call should know well enough to give their name to the person they have called up and let them know with whom they wish to speak from their organization. 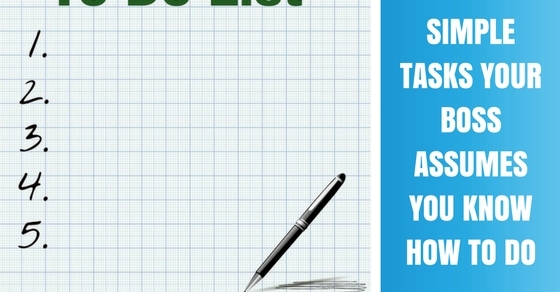 A ‘To Do’ list comes up very handy in the workplace for any person when they know that they come across more than one task in the work place and making a list is one of the best ways to keeping things maintained well enough. Keep everything in a systematic order with all the tasks associated with the proper dates and prioritising certain tasks which are needed to be done earlier in the workplace. And after the task has been completed, then check mark it. As it is a known fact, no one who works does not like getting sick whenever they have a job to carry out and most of the people hate to call in sick for work. Though the presence of the employee is essential in the workplace it is important that if such a situation arises, the boss expects the person to inform the workplace that they won’t be able to make it to work today and so for now someone else can cover up the daily tasks of the day, which can be done by making a phone call. Team work is very important in the workplace to ensure that a task is happening in the proper way and every individual working together should have this kind of behaviour within them. The boss also expects the person they are about to employ to have the same kind of quality with them so that with the collective efforts all of them put in, they can carry out their work in harmony as a collective unit. In this ever challenging world with new opportunities arriving everyday and competition increasing, the boss also may expect the person to maintain a level of networks with other people so that they can let the other companies know what the company they are working for does on a daily basis. This can be done on the basis of the person handing out business cards with their names on it along with the name of the company they are working for others to get a better understanding. No matter where the person is working and what is their role in the workplace, it is always expected that the person can interact well with anyone they come across in and outside the workplace. This would be interactions happening along with people who come and visit the work place to get information or interacting with co workers on a daily basis so that everything works in a smooth manner. The boss also expects the person who they wish to employee to be able to have the ability within them to represent the company outside the workplace or in the absence of the boss whenever required. With a person being able to do this, the boss will realize that they can rely on that individual from time to time and gain confidence and trust from the boss and everyone working well together. A meeting can arise in the workplace at any time during the working hours and the boss expects the person to have the ability to have everything ready at the right time for it. Even if the person has to speak at the meeting to the other people present at it, the boss expects that the person is completely ready with the matter needed to be spoken out at that time and not come in tired before the meeting arises, but be completely ready for it. The attire or clothing that a person chooses for their work should be chosen well and carefully keeping in mind that the business ethics and professional level is maintained at all times. Dress material which is only appropriate at the business level should be worn by them. Formal clothing is acceptable in the workplace as it shows that the person is completely interested in what the job refers to other than casual clothing. The person can refer to the handbook of the company if they wish to get some more information. The appropriate kind of communication is very essential for a person to have in their workplace so that the boss can rely on them at all times to talk on behalf of them whenever needed or making any kind of professional business calls whenever required. So to use the right tone, the right kind of language to keep the conversation respectable and professional is expected to be followed by the person. When the person is working for the boss who runs their own business, it can be expected that during working hours they may not be available at all times in the workplace to monitor the work or carry it out as they may be out on trips or conferences. So the boss expects that in their absence in the workplace, every person should carry out their work in an appropriate way and not let any problem arise. Whenever there is a certain important task which needs to be carried out and completed properly in the workplace, there is a certain deadline set for it to be completed. So the boss expects the person to know that they need to follow that deadline at all times so that no work is kept to be done for the last minute along with all the work being carried out in an efficient way. So, it is expected that every person in the workplace is expected to know certain tasks to be carried out on an everyday basis which their boss assumes them to have when they wish to work with them. So before going for an interview, it is expected that the person knows that they can carry out certain kinds of tasks which is expected by the boss for them to know and they should be well prepared for anything coming during in their workplace after they do get their job. Next articleShould You Resend Your Application If You Notice a Mistake?